In November I took part in National Novel Writing Month (NaNoWriMo), a challenge wherein writers and wannabe novelists attempt to write 50,000 words in 30 days. You have to start a fresh manuscript (no earlier than 12 am, November 1), though outlines are allowed, and the goal is to complete 50,000 words or more by midnight, November 30. For most writers, this does not equal a full, complete novel (this is usually 80,000 words or more), but it does represent a substantial portion of any book. There are no prizes, technically, but for most people who attempt it, finishing is reward enough. I tried this two years ago, but started a novel I had been planning for years, and was (is) very dear to me. This was my downfall. I was so in love with the story, I got hung up on every little point, wanting each detail to be just right. After my failure that year, I knew that when I attempted NaNoWriMo again, it would need to be with a novel and set of characters about whom I didn’t care so much, and with a partner or group to encourage me. My goal, going in, wasn’t so much to create something salable (though that would be a welcome bonus), but to see whether I’m even able to write a project that long, and whether I want to. I knew that in doing so, I would learn about the process and about my strengths and weaknesses. I also knew that if I could power through my perfectionist tendency to give up when I can’t do something justright, I could gain the confidence of knowing that writing a novel is something I can do. And guess what? I did it. And I don’t mind the book that I wrote, so much. I’m even excited to revise and edit it (and write a conclusion). And during the last week of November, when it became clear that I was going to finish, I started to get really excited about starting work on that other novel again, which has been great. The book that I wrote this year is about an obituary writer named Buddy, who develops chronic Lyme Disease, which leads him on a crazy ride of trying to get a diagnosis, and meeting a bunch of interesting people. Each chapter is loosely based on a tarot card, which was fun to write. 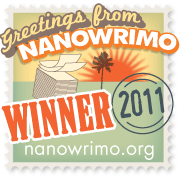 So, what did I learn from completing NaNoWriMo 2011? Everyone has a mid-novel slump. A couple weeks, or about 20,000 words in, you start to hate what you’re writing. Apparently, this is normal. You lose steam, become convinced that you’re writing drivel, and can see nothing right with your work. The only thing to do is to keep writing. Eventually you reach a point where you feel inspired again. You can fix a lot in post. For instance: looking back at what I’ve written, I didn’t really include physical descriptions of any of my characters. Nothing. Only my main character’s drug dealer girlfriend got a description. Even I don’t know what the people look like. Now I can go back and add that! Of course, adding it in the first place would have helped my word count, but the point is, revisions are an important part of the process, and there’s no use getting hung up on little details when you can go back and do it later. Consistency is the key to solidifying new habits. Commit to sticking with something every day for a month, and you’ll have adjusted to the routine of it – and hopefully you’ll start to miss it when you don’t do it. A little support goes a long way. Having friends and peers around to cheer you on when you get discouraged saves the day. And I was surprised by how seeing my friend Nicole’s word count keep steadily ahead of mine motivated me to keep up! It’s possible to find time for whatever you’ve been waiting to do. I am short on time. Always. However, I found the time to write 50,000 words in a month – because I wanted to, and it was important to me. The time was there, I just had to claim it. Six and a half hours of sleep can be enough… at least for a while. No really. I read a study. I wouldn’t do it for long – they said 6.5-7.5 is ideal, and I feel much better after 7.5 hours – but for much of November I was sleeping about six hours each night, and I survived just fine. It’s called coffee, and letting the housework slide. Chipping away at a goal a little at a time will pay off. 100 words here, 100 words there didn’t feel like much while I was writing those small chunks, but at the end of the day when I sat down to write and already had 500 words toward my daily goal – that was a relief!